ScorpiusI just love revisiting images, especially those from the film days. This particular image has always been special to me. It was taken while on an astronomy photography safari at New Mexico Skies near Cloudcroft, NM. We had a large group of astrophotographers and it was a highlight of my photography life. The trip was in May 2003 and film was still a major player in photographic capture. I particularly loved, and still do, the results with my Pentax 6x7 and medium format Provia transparency film. This image was taken with a 55mm lens and presents the entire constellation of Scorpius. It is simply the most colorful region of our Milky Way galaxy. The field of view is just barely clear of our horizon, but we had excellent transparency on this night that permitted the capture of nearly the entire Scorpius region. There are some areas of this image that contain data from other imaging instruments at higher focal lengths to provide a bit more definition to the area. All of the blending data is film with the exception of one very small area which is an early digital capture with a Canon 350D. The image is the December Print of the Month. It is printed on Hahnemuhle Photo Rag paper and matted on black mat with black and silver framing. All glass is museum glass. I hope you enjoy the image and next time you are out under a dark sky in the summer look up and see Scorpius with a different perspective. Please don't forget to click on the image (or here December Print of the Month) and then on the next thumbnail to see the image in the best presentation and full size in the black portfolio window. Buckskin Gulch GlowThe November Print of the Month is "Buckskin Gulch Glow" from the most recent visit to the Colorado Plateau. Incredible fleeting glow in Buckskin Gulch in June 2010. Buckskin is a fabulous hike from the trailhead at The Wave in the Paria Wilderness area in Utah. On this day a brief moment of intense sunlight provided the incredible glow on the opposing wall of the gulch and created a most unique light in the cavernous system. The print is luminescent on Canson Baryta Photographique paper and can be purchased at a 20% discount for the next 30 days. Autumn's BrillianceDriving to The Mountain Institute on Spruce Knob I was captured by this view. It takes a very special scene to get me to stop and work it photographically, but this was the most intense autumn scene I have ever witnessed. The crystal clear transparency was giving way to a blazing late evening sun which was providing the unbelievable back lighting on the leaves and surrounding forest. I only hope I have depicted the scene half as well as the scene looked in reality. It was the most intense display of light and color I have ever come across. The print is titled "Autumn's Brilliance" and is the October Print of the Month. I hope you enjoy the image and the print. Please be sure to click on the image and then click on the thumbnail for a larger presentation in a portfolio black screen viewing mode for greatest viewing effect. September Print of the Month: The WaveThe September Print of the Month has just been released. Not only is this image the September Print of the Month, but it will also make its debut in my upcoming Atlanta show this weekend. So be the first to see the print either at the show or by ordering your special print of the month today! This month's print comes from my most recent visit to the American Southwest. The slot canyons of the desert are amazing places where light, form, and texture reveal the powerful force of water in nature. 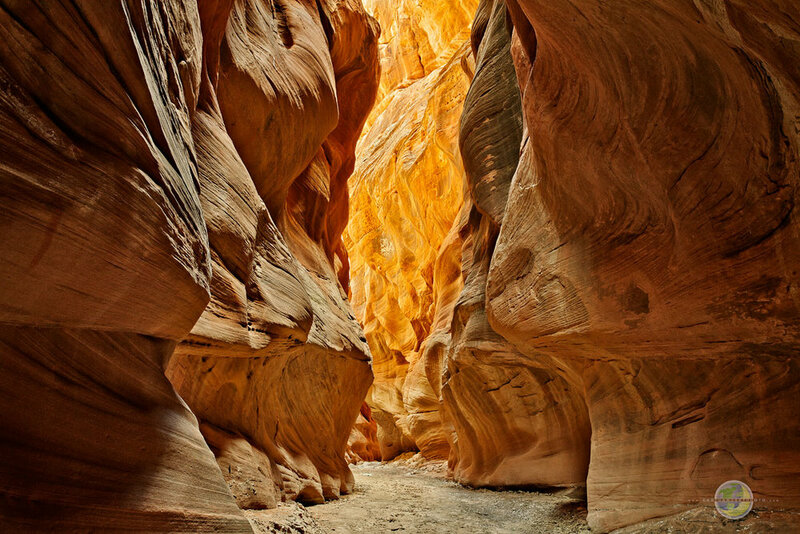 Carved from high pressure flowing water, the sandstone of the slot canyons present to the viewer an intricate wave of textures and colors that are visions one will not soon forget. The mix of color is made up of reflecting light bouncing off of side canyon walls in addition to the bright blue sky lighting up rock formations that are exposed to the sky directly. This particular image is a blend of 5 frames to compensate for the very high dynamic range of the scene. The light in the final print is certainly faithful to the light one experiences while there in person. The limitations of the CMOS sensor in the camera must be overcome by utilizing high dynamic range blending techniques. This image is stunning in its archival framed or matted presentation. Each framed presentation is complete with museum quality glass which provides anti-reflection enjoyment of the print as well as protection against harmful ultraviolet light rays. The framed print looks fantastic in any room. Please contact me with any questions you may have on the print and I hope you find a place in your home or office for this very special piece. Atlantic MorningIn celebration of summer and trips to the beach, I have selected "Atlantic Morning" as the August Print of the Month. This special offer is only available for the month of August and provides a very special 20% discount over standard pricing for a 24x28" matted or framed print. This print is new to the art show display and will be available at the Myrtle Beach Art Show this weekend. I love the frame selected for this print and hope to have an image of it up on the website soon. I hope you find a place in your home or maybe your beach home for this representation of a lovely peaceful morning on the Atlantic ocean.